Zoila Davila creates the original design of a nativity scene that is shrouded in abstraction. Mary and Joseph welcome Baby Jesus shaped only by their cloaks. 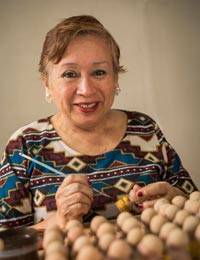 Assisted by her adult children, Davila crafts and paints each ceramic figurine by hand.